The foundation stone of this majestic building was laid by King Edward VII in 1904 and Queen Elizabeth II attended the celebration to mark its completion on 25th October 1978. Even through two World Wars, work of construction never ceased. In a city ravaged by enemy bombs, miraculously the Cathedral escaped almost unscathed. (One bomb penetrated the roof space, but was deflected out through the wall to explode in the street outside, affecting, only the windows on the river side). Breathtaking in its spacious grandeur, it abounds in superlatives...largest Anglican Cathedral in Europe, largest organ in United Kingdom (10,500 pipes), highest (219ft) and heaviest (31 tons) ringing peal of bells in the world, highest Gothic arches ever built, and so it continues, a masterpiece of God given skills, shown in human craftsmanship. Designed by Giles Gilbert Scott, who won the commission at the age of 21, it is built mainly of sandstone quarried in Woolton, a suburb of Liverpool, 5 miles to the South. A 300-strong team of masons was once employed, with the last of the original team leaving in 1981. 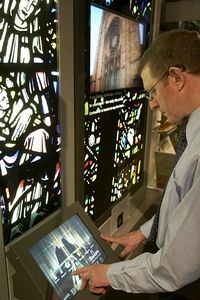 Since construction began, many additions have been made to the general furnishings of the Cathedral, including several works of art and sculpture, plus enhancements to the main facilities to be enjoyed by both worshippers and visitors such as the new film and audio tour, now also in French, Italian, Spanish, German & Polish.A new DVD tour with BSL interpretation & captions that can be taken around on a portable player. 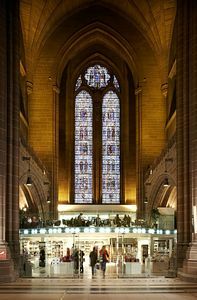 Tower Experience with Embroidery Gallery, new shop and Mezzanine Cafe Bar and refurbished Refectory restaurant. This truly is 'one of the great buildings of the world' (John Betjeman), a living vibrant witness to God, standing over the city, Diocese and region it seeks to serve. From M6 North or South: leave at Junction 21A and take M62 (West) for Liverpool. At end of the M62, follow signs for City Centre and then for Cathedral. Limited car parking (charge payable) at Cathedral. There are bus stops directly outside the Cathedral for both sightseeing buses and the S1 public bus service. The nearest railway station is Lime Street.